Conditional formatting allows to format the contents of a cell dynamically. This can be defined and applied in XlsIO through the IConditionalFormat interface. The IConditionalFormats represents a collection of conditional formats for a single IRange. One or more conditional formats can be added to the range as follows. //Applying conditional formatting to "A1"
'Applying conditional formatting to "A1"
The target range should meet the criteria, which is set using the IConditionalFormat interface. The desired format type is set through the ExcelCFType enumerator, which are the supported conditional format types in XlsIO. Refer to the following code. worksheet.Range("A1").Text = "Enter a number between 10 and 20"
When the criteria set for the target range is satisfied, the defined formats (like the one below) are applied in the order of priority. For more details about conditional format priority, see Manage conditional formatting rule precedence. The following code creates and applies various different conditional formats for different ranges in XlsIO. //Applying conditional formatting to "A3"
//Applying conditional formatting to "A5"
'Applying conditional formatting to "A3"
worksheet.Range("A3").Text = "Enter the Number as 1000"
'Applying conditional formatting to "A5"
worksheet.Range("A5").Text = "Enter a Number which is less than or equal to 1000"
//The operation in SaveAndView under Xamarin varies between Windows Phone, Android, and iOS platforms. Refer to the xlsio/xamarin section for respective code samples. Excel allows the addition of a maximum of three conditions for the same cell in the Biff8 format and XlsIO. 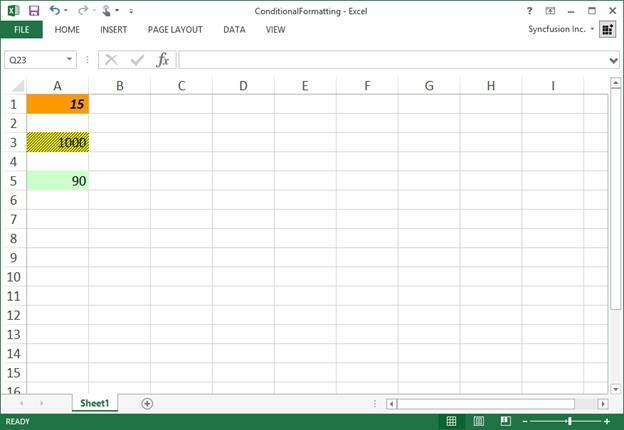 However, this restriction is removed from the Excel 2007 formats. The conditional formats for a single range should be added in descending order in XlsIO. 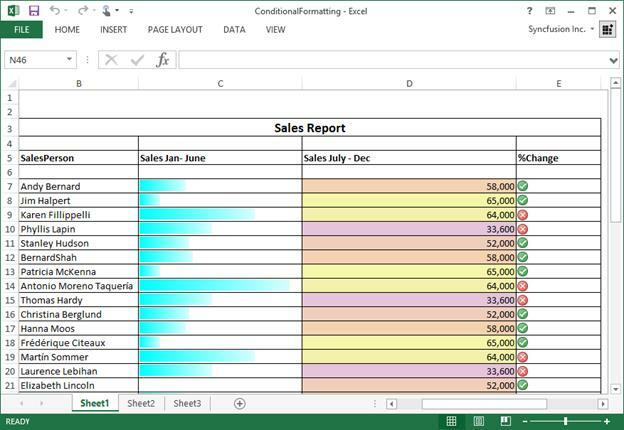 XlsIO also reads conditional formats from existing excel workbook. The following code example illustrates this. All the conditional formats for a specified range can be removed using the Remove method. This is illustrated as follows. A particular conditional format at the specified range can be removed by using the *RemoveAt** method as follows. The entire conditional formats from the worksheet can be removed as follows. XlsIO sets the formula for the conditional format in R1C1-style notation. The following code example illustrates this. 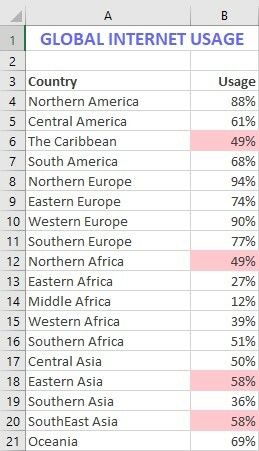 Format unique and duplicate values of an Excel range using conditional formatting. The values, Unique and Duplicate of the enumeration ExcelCFType helps to achieve the requirement. The below code example shows how to format unique and duplicate values using conditional formatting in XlsIO. worksheet.Range("A1").Text = "Global Internet Usage"
The following screenshot represents generated Excel file with unique and duplicate conditional format in XlsIO. In conjunction with basic conditional formatting, the new formatting visualizations such as Data Bars, Color Scales, and Icon Sets are supported in XlsIO. Here, the values in each of the selected cells are compared, and a data bar is drawn in each cell representing the value of that cell relative to the other cells in the selected range. This bar provides a clear visual cue for users, making it easier to pick out larger and smaller values in a range. This can be set and manipulated using the IDataBar interface as follows. Color Scales let you create visual effects in your data to see how the value of a cell is compared with the values in a range of cells. A color scale uses cell shading, as opposed to bars, to communicate relative values, beyond the relative size of the value of a cell. Creation of color scales and its formatting rules using the IColorScale interface in XlsIO is illustrated as follows. Icon sets present data in three to five categories that are distinguished by a threshold value. Each icon represents a range of values and each cell is annotated with the icon that represents that range. Icon sets can be created and customized in XlsIO as follows. You can customize the icon set by changing the IconSet and Index properties for each icon criteria. Custom Icon sets can be created and customized in XlsIO as follows. The application of these visualizations to a sample data and its output file is represented in the following code example. Dim fileName As String = "ConditionalFormatting.xlsx"
XlsIO visualization has been enhanced with backward compatibility for Advanced Conditional Formatting.